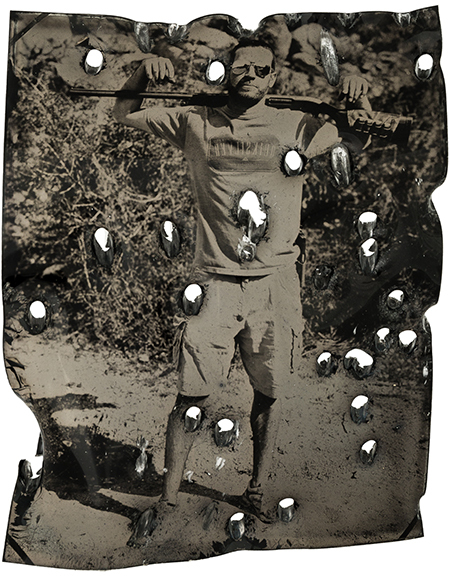 Kari Wehrs, "Tony," 2016, original tintype, 6 1/4 x 8"
For her “Shot” series of tintype portraits, Kari Wehrs took to parts of the Arizona desert used by recreational shooters. Armed with a darkroom tent and tintype camera gear, she engaged shooters in creating portraits — with a twist. First, she’d take a picture of her subject; then she’d invite them to fire at their own portrait. More than two dozen of those tintype photographs are part of this exhibition, which resonates with personal, cultural, and historical meaning. Her subjects were strangers, but this body of work is grounded in the most intimate of relationships: that of mother and child. Wehrs launched the series several years ago, after learning her mother had started carrying a handgun for personal protection. For Wehrs, it signaled a significant divide in their perspectives. And it echoed the chasm that has developed in America’s collective consciousness. Wehrs’ use of tintype photography reminds us that ideological differences have always been part of the American landscape. A technique created in the mid-19th century and popularized during the Civil War, it allows the artist to explore connections between America’s present and its past, even as she prompts consideration of the ongoing role of violence in American culture. “Shot” is thus a critique of both national and personal identity. Her subjects are tasked with deciding whether to shoot their own image, and where to take aim. “Tito” (2016) shows a man who’s fired a single shot, piercing his portrait just once, through his right thigh. “Todd” (2016) features a subject who’s taken more than 50 shots at his own image, without ever piercing the long gun held across his chest and aimed towards the sky. Most of Wehrs’ subjects are men, but there are portraits of women as well. Two photographs feature a parent and adult child. For Wehrs’ subjects, as well as gallery-goers, these images present a poignant opportunity to reflect on the ways guns impact their lives, and the ways we manage our differences with those we love, those united under a common flag.